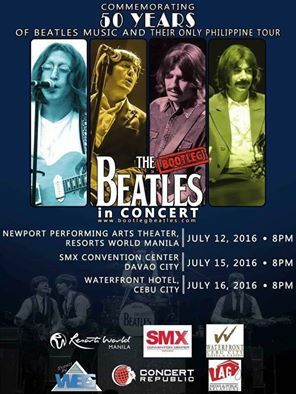 Get a chance to win two (2) tickets to The Bootleg Beatles happening on my birthday (July 12, 2016 ) at Resorts World Manila. 4. Answer the question, "Who you're bringing to The Bootleg Beatles and why?". Comment with your name and email address. - One (1) Winner will be chosen via the best answer. - Winner will be announced on July 12, 2016, 1am via announcement at Facebook and this blog. - The two (2) tickets to The Bootleg Beatles may be redeemed on July 12, 2016 at the concert venue, (Resorts World Manila) under TAG Media booth c/o Engr. Grace Nicolas. Happy birthday, Joy! Looking forward pa naman to see you there but nway, enjoy your birthday. May it be the happiest among the many happiest birthdays! This promotion is very timely as it was announced on my birthday. Perhaps fate would favor my side so I can take my father with me. Neither of us have gone to a concert especially those of the "legends" in the music scene. Every birthday is special but this one would be "extra" special if I get to do an unforgettable good deed; by being the giver of one of my dad's memorable moments. Thank you, Occasions of Joy.